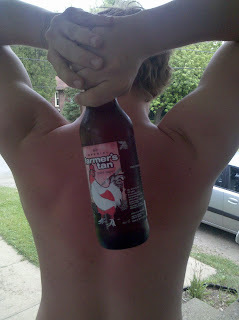 Farmer's Tan- check. It is the season where pasty human beings get their first prolonged exposure to the sun to leave some unsightly color lines on your body. Southern Tier celebrates such an event with their new summer seasonal bomber, Farmer's Tan. Farmer's Tan is an imperial pale lager weighing in at an impressive 9% ABV. In theory, it is a perfect summer beer for the lazy- crisp and light yet higher in alcohol- best suited for an evening hanging out on the porch. Farmer's Tan pours a slightly more carmel color than a typical pale lager yet has a floral pale ale smell. This medium bodied beer is well balanced with little alcohol taste left on the tongue. It is not a beer that typical lager drinkers would enjoy- in other words, it doesn't taste like urine. There is a bit of sweetness that lies in this brew that eventually leaves the tongue to give a more traditional lager aftertaste. This beer lived up to the promise of a lazy summer night. Southern Tier took a traditional style and grew it into something of their own. While many breweries try to lighten their load with a more traditional pilsner or wheat ale for the season, ST took a great summer style beer and made something that could pass the piss test.